Why so serious, NYC? 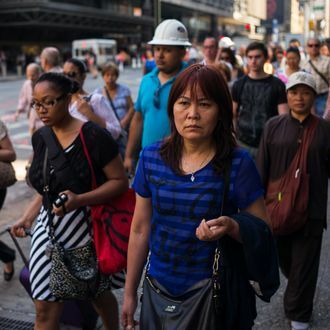 New research suggests that New York City is the unhappiest major city in the country, after adjusting for income. The researchers, led by Joshua Gottlieb of the University of British Columbia’s Vancouver School of Economics, came to their conclusions by using data from a 2010 U.S. Centers for Disease Control survey on American life satisfaction. (Quick caveat: It’s a “working paper,” which means it hasn’t yet been peer-reviewed.) And while they didn’t specifically examine the cause of unhappiness, I bet we can come up with a few. First, the researchers did find some relevant correlations, including a link between unhappiness and residential segregation; in New York, data suggest that neighborhoods are increasingly becoming segregated by income. And even something as seemingly mundane as the weather can have an impact on subjective well-being; Gottlieb said in an email that he and his colleagues found some (weak) evidence that milder winters result in greater life satisfaction. And let’s not forget that in New York, the rent is too damn high; since 2000, the average rent has increased 75 percent, while the average income dropped 5 percent, according to a recent report from the city controller. Here’s the ranking of the ten least happy cities with a population greater than one million, after adjusting for individual demographics, plus income and employment status.